Being accused of a crime is always a stressful situation, and the stakes are high. That is why it is important to have a knowledgeable, skillful and passionate lawyer on your side. Regent Law has past experience working with Public Prosecutions, which helps us better defend your interests. Preliminary Notes - If you have not yet been contacted by police, I can help you determine your risks and develop a strategy for moving forward. If you have already been contacted by police, either for a statement or because you have been charged with a crime, it is important that you consult a lawyer before making any comments to police. There is a reason the police explain to you upon arrest that they can and will​ use anything you say against you in court. 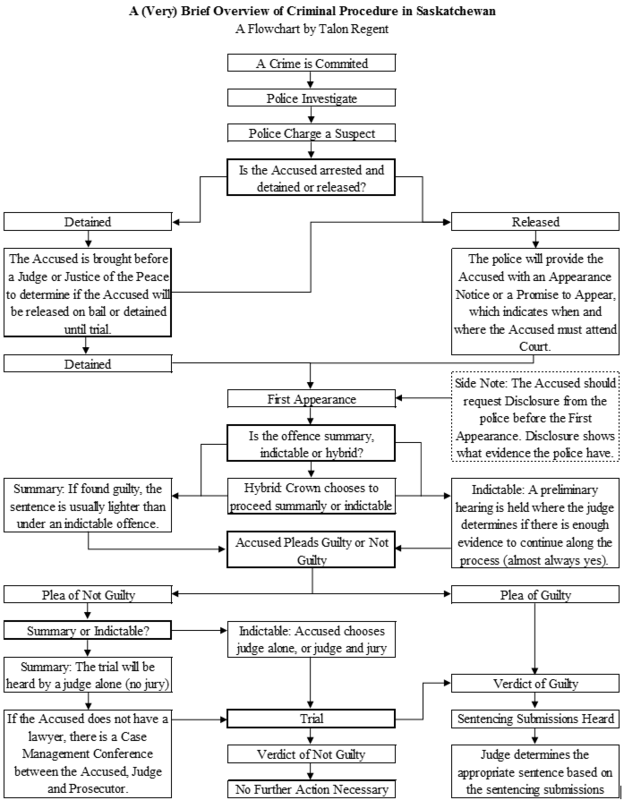 Process - Please note that the flowchart below is a very brief overview of the process that is only meant to give you a general idea of what to expect. Do not rely on this flowchart as a precise guide. For a written explanation of the process and a bit more depth, take a look at PLEA's article titled Going to Criminal Court.